The skin is the body’s largest organ, so taking care of your skin with healthy habits and nourishing food is crucial. Many conventional skincare products are toxic, but those toxins don’t remain on the surface of the skin. Instead, we absorb numerous chemicals into our bodies. Choosing clean, natural skincare is a healthcare issue that is beyond skin deep. What we put on our bodies can affect our health from the inside out. Below, we’ll show you how to choose the right natural products and food for your skin. Sadly, many conventional cosmetics, skin, and body care products sold today are filled with toxic chemicals, dangerous ingredients, and fragrances that have hormone disrupting impacts on the body. The chemical burden that is applied to the skin doesn’t just stay there. Instead, when chemicals or toxins are absorbed through the skin, they circulate in the bloodstream and end up in the liver and other detox organs, creating a toxic burden. Shoppers have a common belief that companies can’t sell something if it isn’t safe, but this is a myth. 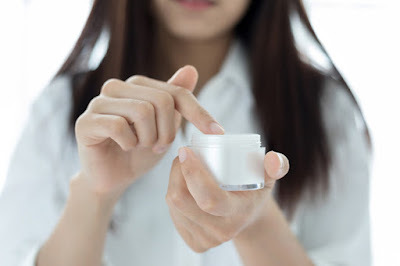 Cosmetic, skincare, and body care companies frequently include ingredients in their products that are not thoroughly researched, or which have actually been proven to be unsafe. Since women are the primary users of cosmetic and skincare products, the biggest concern comes in the form of endocrine disruption, or hormone imbalance. Using multiple products daily that contain plastics, parabens, and fragrances can create a body burden. When you know how to read labels on makeup and cosmetic products, you will be better able to avoid the ingredients that have negative impacts on your body. Tip: While we will cover the top offenders here, this is far from an exhaustive list of hormone-disrupting or otherwise nasty chemicals. The Environmental Working Group, or EWG, has an online database to help consumers make smart and clean choices for their cosmetics and skincare. It is called SkinDeep, and it is free to search. Parabens are used as preservatives, primarily in skincare and makeup products. They inhibit bacteria from growing, but when humans are exposed, they can also disrupt normal hormone production and mimic estrogen in the body, which can lead to problematic consequences like skin cancer and reproductive problems. These ingredients are used to customize fragrances and scents. Nearly all cosmetic products, even those that don’t have a strong smell, contain some form of fragrance. Because fragrances are considered trademarked by many companies, products don’t always have to be labeled with “phthalates.” So it’s important to note that if something has a scent, unless natural ingredients are responsible for the fragrance, then phthalates are typically involved. These ingredients are also hormone disruptors; they can lead to reproductive toxicity and can even be problematic for breast cancer. While phthalates can be associated with fragrance, a scent can be made of many other ingredients. Many labels will simply list “fragrance” or “parfum” as the ingredient, and not delve into what specifically was used to create the fragrance. Often, fragrances use a mixture of chemicals and natural scents to produce a signature smell. Fragranced products can be associated with reproductive toxicity, allergies, and topical skin irritation. Short for “butylated hydroxytoluene,” BHT functions as a preservative in numerous skincare, cosmetic, and even food products. It is a common skin irritant and can also lead to organ toxicity and reproductive problems. Perhaps the oldest known offender, lead is still predominantly found in conventional makeup products like lipstick, eyeliner, nail polish, blush, and anything else that has a deep pigmentation. Lead contamination is associated with cancer, reproductive problems, developmental disorders, and an overall cumulative body toxic burden. While it’s found in small amounts in most cosmetics, it easily absorbs through the skin. Another preservative used to prevent mold growth, DMDM hydantoin is often found in makeup and hair products. It releases formaldehyde to stop the growth of bacteria and other microorganisms. While the companies don’t directly add formaldehyde, this product produces formaldehyde, so it can be just as harmful. Formaldehyde is a known carcinogen and can also irritate the eyes, skin, and lungs. Your skin is constantly irritated. You have asthma or other allergies. You have chronic or autoimmune conditions. You never wash your face. You use cosmetic products that are past their expiration date. Natural skincare doesn’t have to be complicated. There are easy, basic principles that can be applied to your skincare routine while also taking it to the next level. Do: Wash your face regularly, even if you only use water. Don’t: Use chemical-laden, scented soaps or cleansers with excessive foam. This strips the natural oil from your skin. Do: Use a microfiber cloth to naturally exfoliate without harsh chemicals or cleansers. Don’t: Use a microbead product that is filled with tiny plastic pieces. These irritate the skin and pollute the environment long after they’ve been washed down the drain. Do: Use a natural oil (like coconut oil or avocado oil) to moisturize your skin. Don’t: Use products that are filled with synthetic anti-aging ingredients, fragrances, and countless other chemicals. Simpler is better! Do: Use a natural, clay-based or avocado mask. Your skin absorbs ingredients, so you should feed it real food and nutrients from the earth. Don’t: Use an expensive chemical peel or product that will be harsh and abrasive on your skin. Do: Use it, but choose one with a natural, mineral-based sunblock. Don’t: Use aerosol sunblocks, which are filled with extra chemicals that your skin will absorb. Do: Embrace the concept that your skin needs oils for protection and a youthful appearance. Don’t: Assume that oil cleansing will make oily skin worse; natural oil cleansing helps the skin to balance oil content on its own, without harsh cleansers or chemicals. The most common skin type is normal or “combination” skin. A few patches of oily spots, especially in the “T” zone, are very common and not a problem that needs fixed. Gentle, daily face washing is recommended, either with plain water or rosewater. Moisturizing should also be done daily, but with a tiny dab of natural oil, like jojoba, almond, or even coconut in the cooler months. While all skin needs some oil, overactive sebaceous glands in the face can produce more oil than is necessary, resulting in acne, large pores, shiny skin, and blackheads. While weather and hormones can play a role, diet and skincare methods can also help or worsen this condition. Over-cleansing skin will exacerbate the problem, so limit face washing to once or twice per day, and don’t use a harsh cleanser meant to strip oils from the skin. Instead, use a gentle rosewater and then follow with a toner that can reduce irritation, like apple cider vinegar, witch hazel, aloe, or calendula. After toner, apply a small amount of a natural oil, since even oily skin needs oil to stay balanced. When oily skin becomes overly dried from excess washing, it will continue to produce oil and the pores will remain enlarged from irritation. Use jojoba, tamanu, or a touch of vitamin E oil to moisturize gently. Dry skin can be a common part of aging, but it can also be genetic or a side effect of numerous conditions, like thyroid problems or postpartum issues. Skin that is dry can look dull, wrinkle faster, and even become cracked and irritated. Avoid excess washing since washing and drying can remove moisture from the skin. After washing with water, immediately apply a thicker, moisturizing oil to the face and skin to trap in the moisture. Argan, avocado, almond, emu, and coconut oil are all excellent options for rehydrating the skin. For skin that is extra dry, extra virgin olive oil can be used, especially during winter months.